Taj Mahal: the iconic image of India. 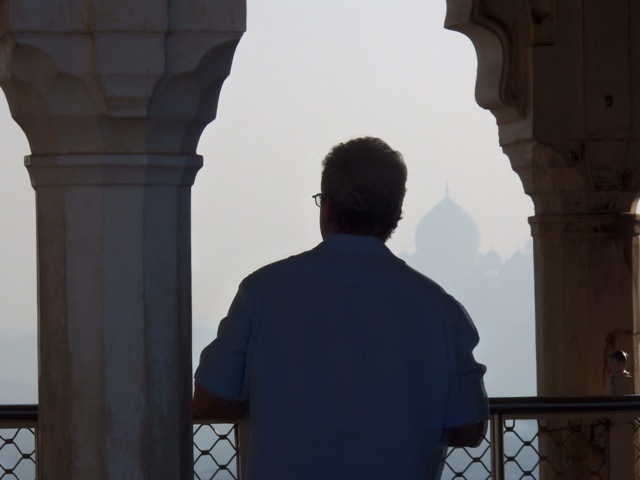 Most visitors to this country of over a billion inhabitants fly in to Delhi, drive three hours to Agra to see this World Wonder, and then leave. But there are plenty of reasons first timers to India should stay a few days - a couple of nights in Delhi and one in Agra, in order to delve a bit deeper into a culture that may perplex, may cause angst, but is, at its heart warm, colorful and eager to please. 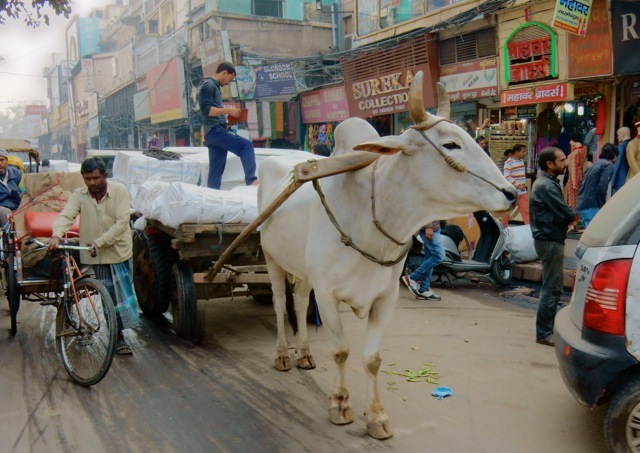 Over 1.3 billion people live in India, with population centers like Mumbai, Delhi, Calcutta and others a snarl of humanity, animals, and vehicles like no other. An unceasing stream of cows, cars, trucks, monkeys, tuk-tuks, bicycles, scooters, donkeys pulling and merchants pushing carts, potholes, dirt roads, dust, smog, shanties, tents, tangled wires, honking horns - this pageantry on every street may cause extreme disorientation. Just be prepared and go with it. (And, FYI, wear closed-toed shoes). The bulk of foreigners choose to stay in upscale hotels for good reason. These tend to be cordoned off from city grime and hubbub to a hermetically sealed degree. Surrounded by walls, and protected by several layers of security gates, these hotels seem to be quiet, exquisite lands unto themselves. If you're 18, backpacking and/or don't mind full emersion into the culture, by all means find local hostels or homestays. For Boomers in need of all the creature comforts, stay high-end. 1. 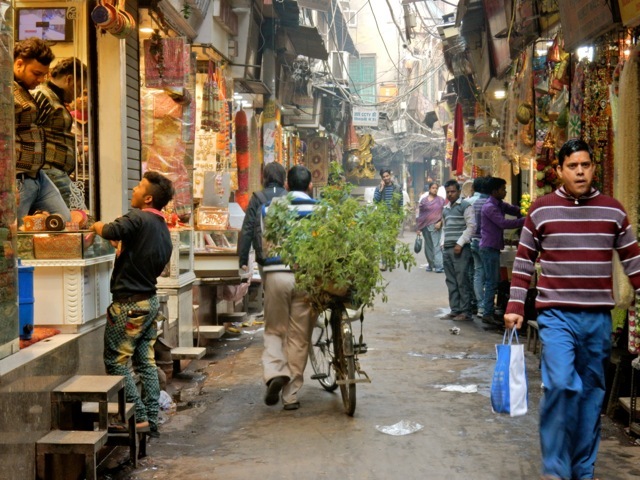 Wander the streets of Shahjahanabad (Old Delhi) - an over-stimulating experience best explored with a guide, because you'll really want to taste some of the street foods you've been warned not to eat. 2. That said, try a stuffed paratha at the over 100 year old Pt. 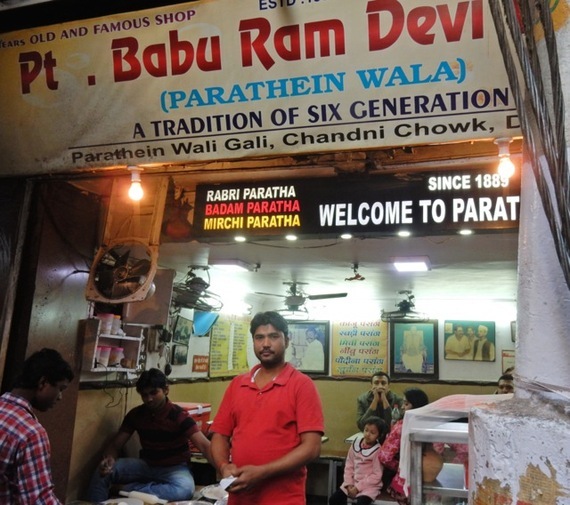 Babu Ram Devi Dayal Parathe Wali - a true hole in the wall beloved by celebrities and India's foodies. In a cubby sized space, there are three tables for 2 (ok, try squeezing 4 around one of those tables). Each just-fried paratha comes with fiery sides. If this is your first meal in India, just be prepared for the heat. 3. 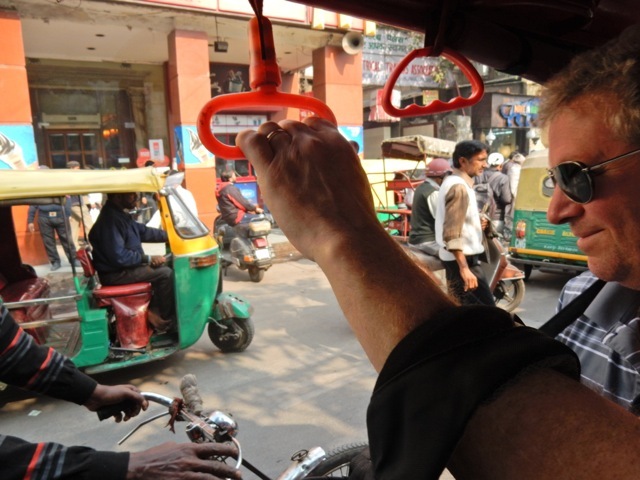 Jump on a rickshaw - or tuk tuk - to get to your next stop. It's cheap, fun and as a small vehicle that can weave through traffic and around people, the most convenient way to go short distances. 4. 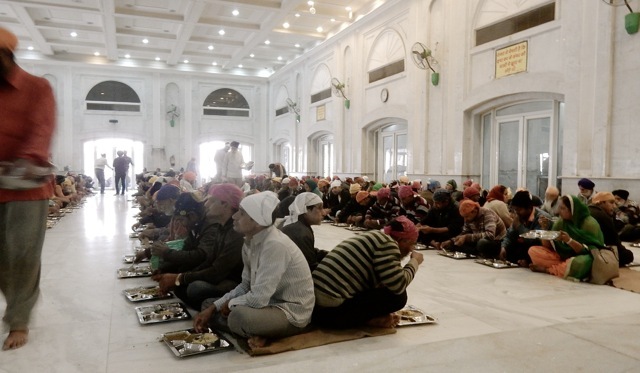 Watch volunteers prepare and serve meals for 10,000 people a day at the Gurudwara Bangla Sahib Sikh Temple. You can eat, sitting cross-legged and quietly, along with thousands of others in the Temple's vast dining hall, regardless of your social standing, religious practice or gender. Even if you do not intend to partake, stop into the kitchen where cooks make bread, dal and other dishes in enormous vats. It's a heartwarming sensory experience you won't soon forget. 5. In Old Delhi, stop into Jama Masjid, one of India's largest mosques, built by Mughal emperor Shah Jahan (who also built the Taj Mahal) between 1644 and 1656 at a cost of 1 million rupees. 6. Visit Qutub Minar, a World Heritage site. 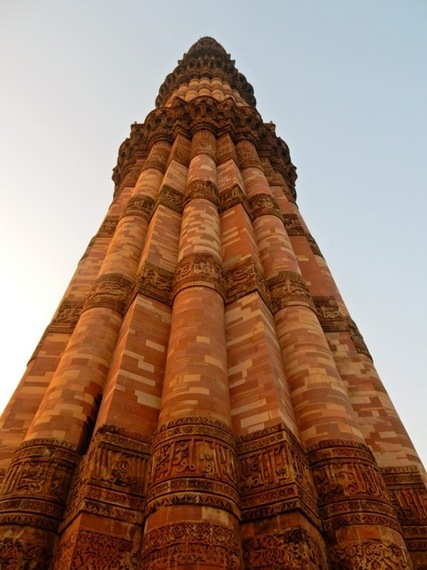 Built in the late 12th century, and standing 240 ft., it's the tallest brick minaret in the world, made of red sandstone and marble, and inscribed with verses from the Quran. 7. Tour Humayun's Tomb - another UNESCO World Heritage Site regarded as a model for the Taj Mahal. 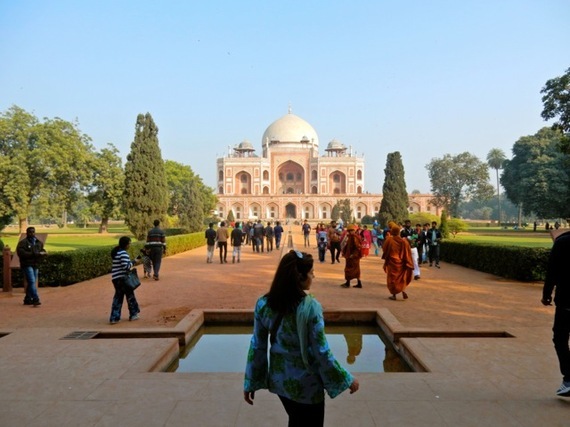 This regal mausoleum, built in 1569, fourteen years after Emperor Humayun's death, is the first distinct example of proper Mughal style, inspired by Persian architecture. Humayun, the region's second Mughal ruler, was father to Akbar - considered one of the greatest "moguls" in history because he expanded territory through conciliation and tolerance rather than violence and extremism. 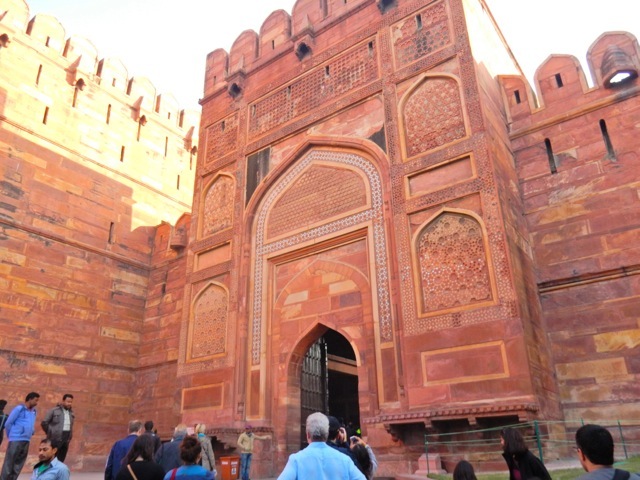 (See Fatehpur Sikri below). 8. Learn about the centuries-old practice of rug making from a reputable source (Emporium, 22A Janpath, New Delhi) that represents northern India tribal families. The work is exacting - artisans tie individual knots of various hued silk threads (the highest quality at 2,800 per square inch) to create geometric patterns and color combinations, passed down from generation to generation, specific to each clan. 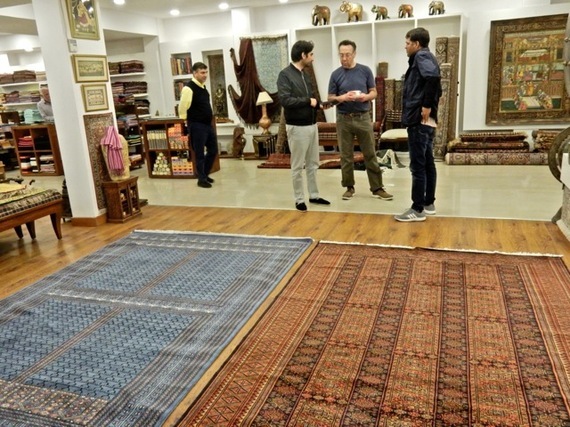 Whole families work on one rug for several hours each day for years, and the results are so stunning and well made - not to mention, as a dying art, getting rarer by the day - you'll might just want to have one or two shipped home. 9. 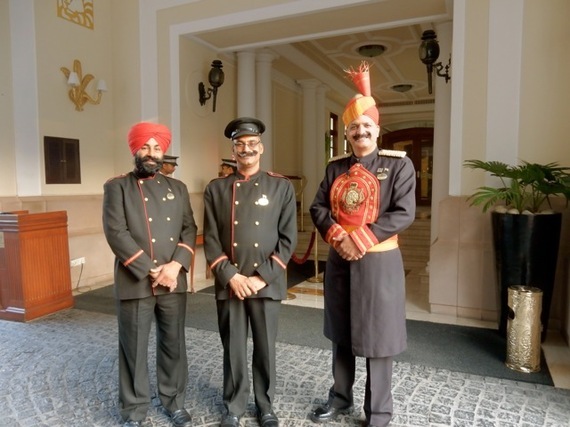 Stay at The Imperial Hotel, New Delhi - a swanky favorite of foreigners. Like the Victoria Falls Hotel in Zimbabwe, it harks back to British Colonial days, particularly the tony 1911 Bar, which has been declared one of the Best Bars in the World. 10. 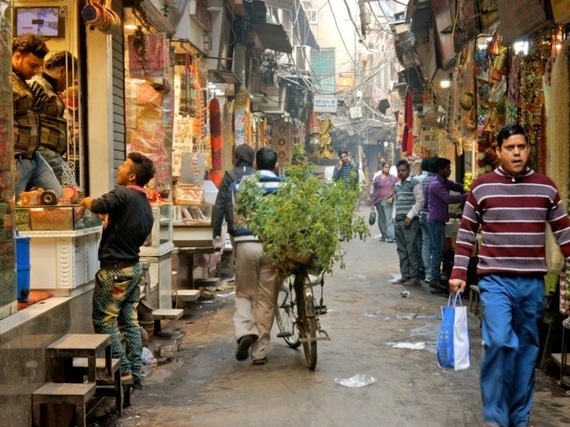 It's a long 15-20 hour travel day from New York to Delhi, so book a massage at the hotel of your choosing. The Spa at the Imperial Hotel is particularly glorious, and après-massage you can take advantage of soaking tubs and saunas. 11. 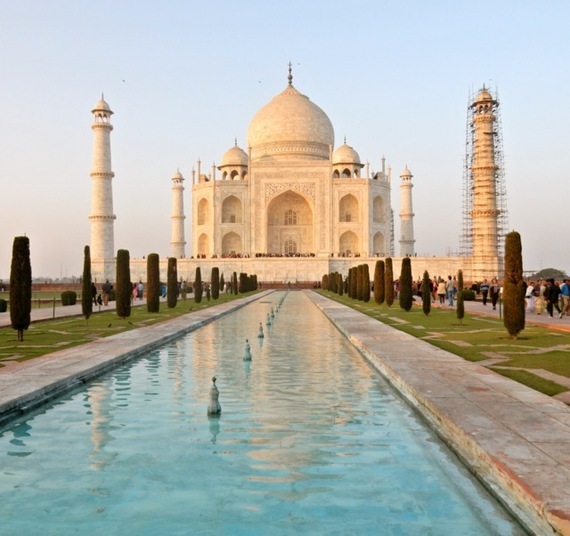 Tour the Taj Mahal, Agra, preferably two hours before sunset. 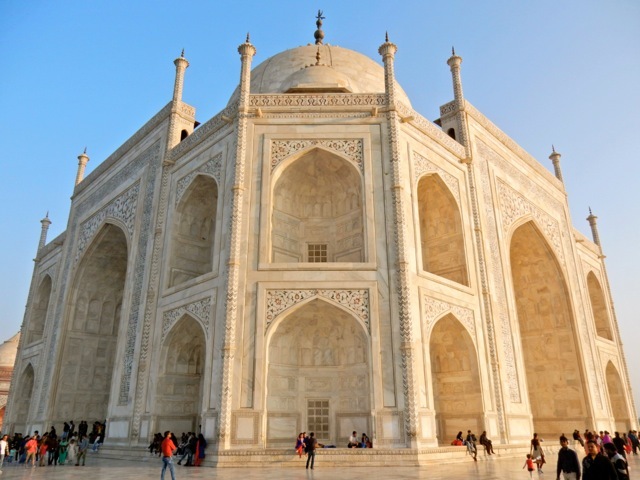 A UNESCO World Heritage Site and one of the Wonders of the World, no photograph or Instagram snap will ever capture the true grandeur of this mausoleum, even more spectacular during the "Golden Hour" of the setting sun. Commissioned in 1632 by the mourning Mughal, Shah Jahan, to house the body of his most beloved wife, Mumtaz (who died giving birth to their 14th child), the tear-drop shaped white marble Taj Mahal is even more magnificent up close. The smooth marble is inlayed with multicolored stones depicting images of drooping flowers. Passages from the Quran are inscribed on its walls. 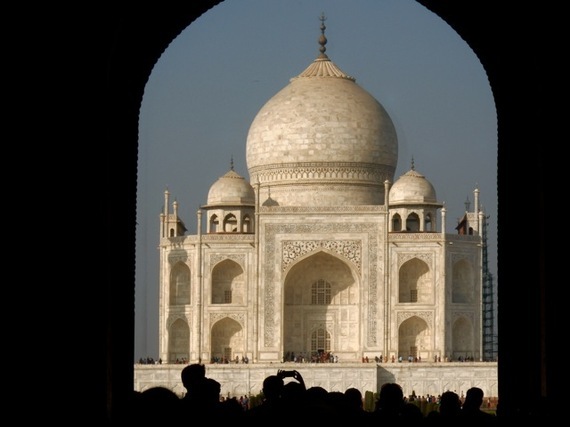 The Taj is elegantly feminine from its shape to décor; an eternal gift to the world. 12. 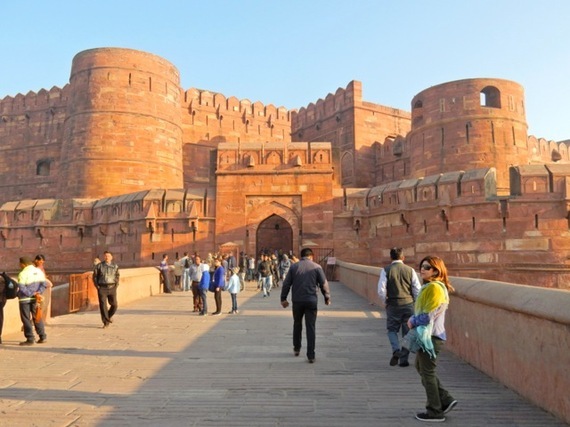 No visit to Agra would be complete without a visit to Agra Fort. It was here that Shah Jahan's son, Aurangzeb, imprisoned his father after killing his two brothers and taking over the Empire. The "Fort" is actually a beautifully restored palace complex - each section, from gardens to pavilions, to frescoed rooms - are worth a peek. 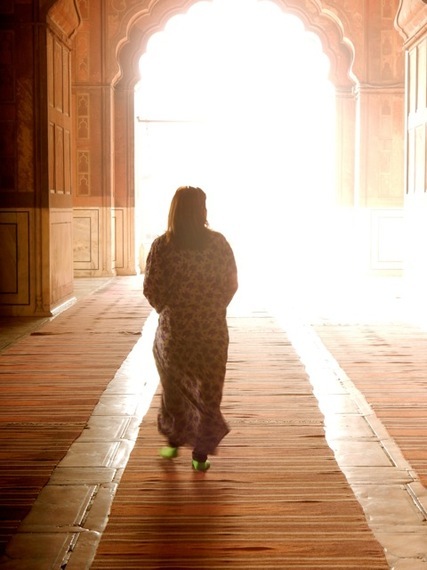 Particularly moving is the room in which Shah Jahan chose to stay - in darkness, in depression - for the year following Mumtaz's death. From one window, he could gaze out onto the Taj Mahal - where her body slept for eternity. 13. Visit Fatehpur Sikri, a city about an hour outside of Agra, founded by Akbar in 1569. The incorporation of Indian, Persian and Arabic architecture illustrated his open-minded approach to the best of all cultures and in fact, one of the most astounding buildings on site is the red sandstone Diwan-i-Khas, or The Hall of Public Audience. 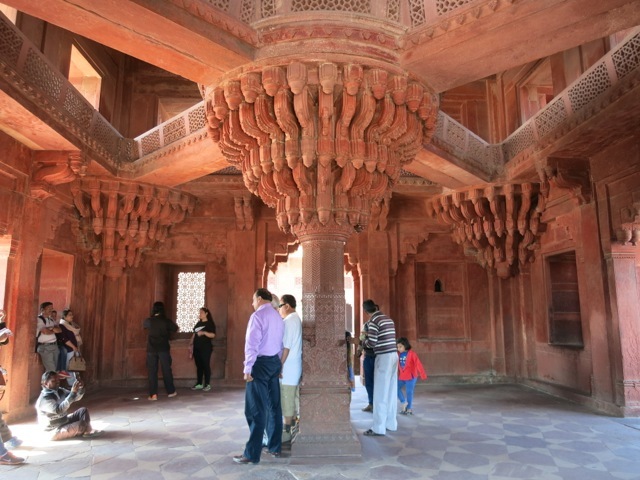 Akbar would meet and dialog with representatives of all religions beneath a ring of carved, phallic like serpents that top a center marble column etched with geometric patterns and flowers. 14. 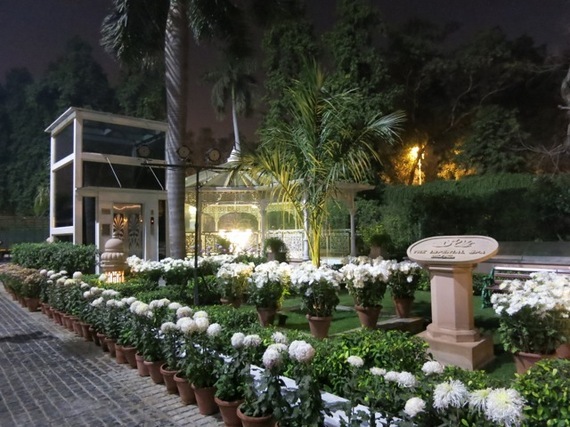 Stay away from the crowds at ITC Mughal Hotel, Agra. Yes, there is one exclusive hotel within view of the Taj Mahal - the Oberoi Amarvilas -and good for a huge splurge. But if you can't spend $2,000 per night, and want an upscale experience for around $100, the ITC Mughal is perfect. 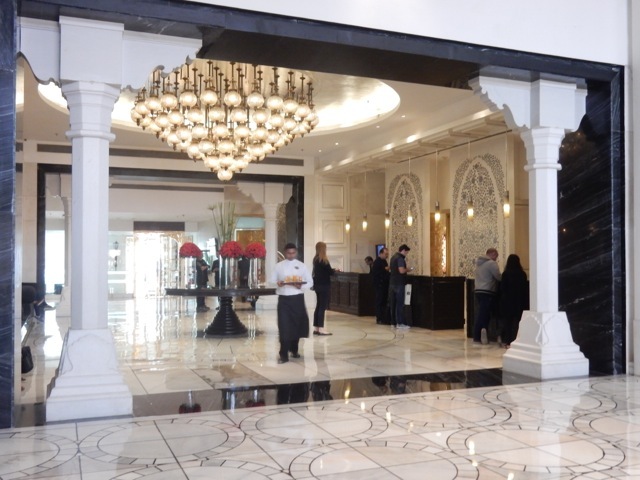 Again, the gates lead to a place of respite, the common areas are stunning in marble. Breakfast (with room) is expansive, and the spa is lovely.